Microsoft launches Surface Pro 3 and Surface Pro 4 hybrid tablets in India. Here are the pricing details! 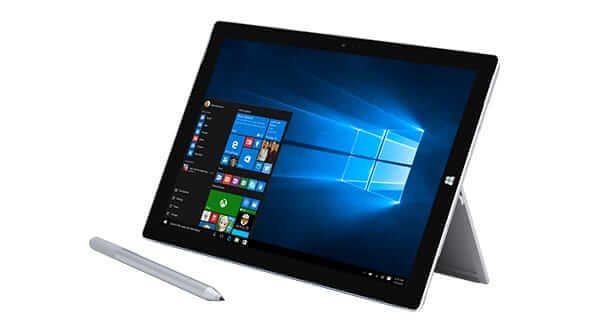 As we reported yesterday, Microsoft has launched its Windows 10-based 2-in-1 hybrid tablets – Microsoft Surface Pro 3 and Microsoft Surface Pro 4 – in India today. The Surface Pro 3 has been priced at Rs. 73,990, while the price of the Surface Pro 4 starts from Rs. 89,990 in the country. These tablets have 12-inch Pixel Sense displays, Intel Core processors, SSD storage, front-facing and a rear-facing cameras, stereo speakers with Dolby Audio, a keyboard accessory, and a Surface Pen, which make them productivity-focussed tablet devices. These tablets compete not only with hybrid tablets like the Apple iPad Pro and the Google Pixel C, but also with the likes of Apple Macbook Air, thanks to their lightweight design, long battery life, and a desktop-class operating system. The Surface Pro 4 features a 12.3-inch Pixel Sense multitouch display with a resolution of 2,736 x 1,824 pixels and an aspect ratio of 3:2. It comes in three processor variants – Intel Core m3, Intel Core i5, and Intel Core i7 – and 4GB/8GB of RAM. It comes with 128GB or 256GB of internal storage space depending upon the variant. There’s an 8-megapixel primary camera and a 5-megapixel secondary camera, and both can record 1080p videos. It can also authenticate user login through Windows Hello using the inbuilt camera or the fingerprint sensor on the Surface Type Cover. The Surface Type Cover has a larger trackpad, more space between the keys, and it is still thinner and lighter than the previous keyboard cover. 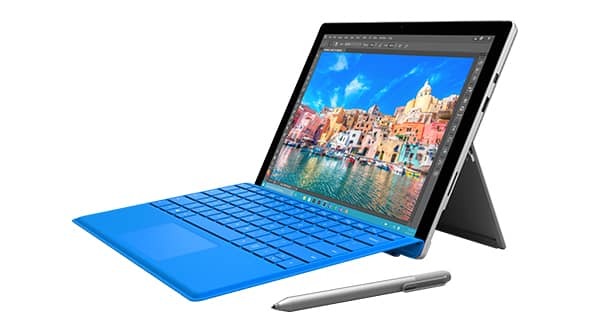 Connectivity features on the Surface Pro 4 include Wi-Fi ac/b/g/n, Bluetooth v4.0, USB 3.0 ports, SD card reader, Mini Display port, Surface Cover port, and Surface Connect. The entry-level variant of the Microsoft Surface Pro 4, which is priced at Rs. 89,990, will be available exclusively through Amazon India, and the pre-bookings for the device will start from today. Amazon will start shipping the devices from the 14th of January. Microsoft will also showcase its latest 2-in-1 hybrid tablet at Microsoft Priority Stores in Delhi, Bangalore, Gurgaon, Mumbai, and Noida. The Microsoft Surface Pro 3 features a slightly smaller 12-inch ClearType IPS LCD display with a resolution of 1,920 x 1,080 pixels, an Intel Core i3 processor, 4GB RAM, 128GB SSD storage, a 5-megapixel rear-facing camera, a 1080p front-facing camera, stereo speakers, and a 5,574 mAh battery. This is the only variant that has been launched in India, and it will be available exclusively through Amazon India. Pre-orders for the Surface Pro 3, which is priced at Rs. 73,990, will start on Amazon.in today, and the devices will be shipped to buyers starting from January 14.